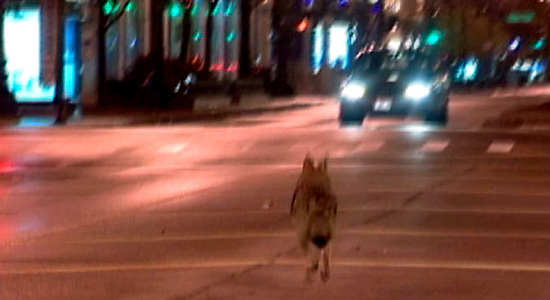 The coyote seen roaming around Downtown Chicago the other night may not be one of the pack fitted with GPS devices and let loose around the city “to help deal with rats and mice,” but learning that there is actually such a pack sent us into ecstatic fits. 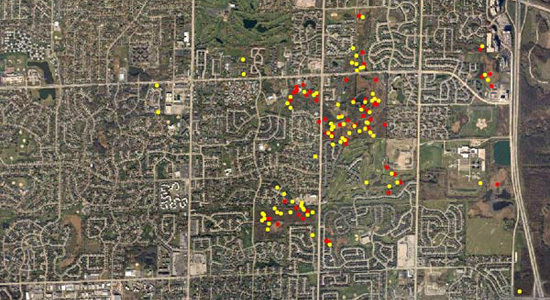 We have tracked the coyotes day and night and located the collared coyotes more than 40,000 times. 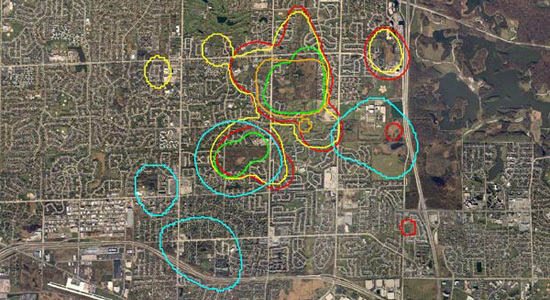 This allows us to peek into the hidden lives of urban coyotes. We use results from this unique project to answer common questions regarding coyotes in urban areas. Many aspects of coyote ecology have direct management implications. Although our study was focused on Cook County, Illinois, we believe the things we have learned about coyotes and people living together are indicative of many metropolitan areas in the Midwest and eastern United States. Set up an API to give mobile software developers a way to access those radio pings, and there might be apps to track the coyotes' urban ramblings. Google Coyote®. And yes, we're betting that it will have an audience. It's no different than nature webcams and participatory GIS platforms, like Google Earth, both of which have sizeable user base. It's also not uncommon for a lot of people to have their only extended contact with the wilderness mediated virtually. Make the interface slick, and the data pornographers and Tufte zombie acolytes will come in droves. Develop it into an iPhone app, and you have the makings of an urban safari fad, as popular as birdwatching or urban GPS-tagged fruit harvesting. And to make it more interesting, that is, to approximate the conditions of a Serengeti safari, dial down the app's locative precision. Instead of giving you exact coordinates, it only tells you that the coyote is roaming somewhere in Hyde Park. Touring the city in search of indigenous cyborg fauna. "Touring the city..." -- I (think) I am up to it. I have to admit I was a little disappointed because I was hoping they had released the coyotes as an active management tool for pest and rodent control. It seems like that would have been a sort of urban intervention of the ecological services mode that I could get behind. , a predatory canine urbanism? Just imagine all the urban cat owners that would like to use this technology. Coyotes are pretty cool, but I have to imagine that they are eating a lot more than rats. I lived in San Diego and heard a Coyote eating a cat right outside my window a few years back. The sound of the cats bones snapping is still hard to get out of my mind. I feel like I've seen enough coyotes that I don't think I would use an app to track them down for a real life encounter, but if you could track birds of prey or something like that that I have never seen up close before I might just download that app.